In the countryside where I grew up, there was a bamboo forest nearby. Our family ate bamboo shoots in the spring, and there were many household items made of bamboo. So I feel bamboo was always part of my life. 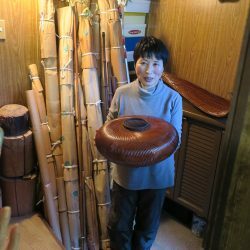 There was a man who made bamboo baskets near my childhood home. I was always fascinated watching him make baskets. One time, I asked him if he could teach me, but he declined saying he was too old to teach anymore. Many years later, I was visiting Osaka for two days. During the first evening I felt something exciting would happen the next day. The following day, I had some spare time and decided to go see Chikuunsai III’s exhibition at a department store art gallery. He spoke to me while I was there which eventually led to my becoming one of his students. My family was against my studying bamboo art, but I felt very strongly about my instinct and this exciting new direction in my life. Bamboo has strength, pliability, and the wonderful beauty of its natural colors and shapes. When I try to use it as an artwork medium, it is like a person who you like very much and is at the same hard to please. This can create a dilemma in how to approach it, and at the same time be one of the charms of this material. It is challenging to bring the best out of each culm of bamboo with the desire to express something beautiful, elegant,and exciting. Oh, how I wish I had more time for my artwork. I need to spend a good deal of my day doing family household tasks. This makes me think, am I really a professional artist? My immediate goal is to spend more hours focusing on my artwork.